As you look back over our generation, whom would you list among the greatest Christians? Billy Graham? Matt Redman? Mother Teresa? Joni Eareckson Tada? All these names are well-known, all are people who have dedicated their whole lives to the cause of Christ, and all have had an immense reach in terms of the numbers of lives they have touched with the love and grace of God. So, using Jesus’ measure of greatness, who would you put in your list? Here are my top two. The first is an aunt-in-law of mine. She died last year at the age of 99, having lived all her life in the house in which she was born. As a young woman, her father decided that she would not marry, but would be the one to look after her parents in their old age, and therefore she was not allowed to have boyfriends. She did indeed care for her parents to the end of their lives, while also working in a clerical job. By the time her mother died a few days short of her 106th birthday, she herself was 73, still rising early every morning to take her mother breakfast in bed. I never once heard her complain about her lot in life. 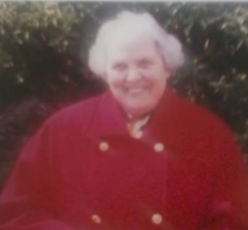 Instead of living with regrets of what might have been, she lavished affection on her nieces and nephews and later on their children, and threw herself into the Girl Guide movement, keeping herself young by sharing fun, high-jinks and her quiet but vibrant Christian faith with generations of teenage girls. She was and is my heroine. The second is someone whom I have never met and had never heard of until last month. 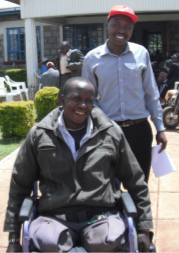 George is someone whom our mission team met in Eldoret, Kenya in May. George’s legs were amputated following an accident. He was fortunate enough to receive a wheelchair and so was able to continue working as a shoe seller. When he met a woman who had also had her legs amputated as a result of damage caused by diabetes, he considered her need greater than his own and gave away his wheelchair to her. From then on his journey to work consisted of dragging himself along the ground to the bus stop, crawling onto the bus which took him to work where he sat on the ground at his shoe stall, and then reversing the process in the evening. Our team was able to bless him with a new wheelchair and so his generosity to that lady was rewarded. Both these people lived or live in a narrow circle of acquaintance. The world takes no notice of them and their sacrifice passes unobserved by most of the world. But God sees, and in His eyes they are among the greats, the giants of the kingdom of God. It’s people like this who set the bar for us as Christians – may we imitate their way of life and grow in Christ-likeness because of their example.